Whether you’ve noticed it or not, Korean automaker Kia has definitely hit its stride. And the company, whose sales skyrocketed by over 27% last year, shows no signs of slowing down either. The impetus behind this ascension is the quality of its products, more than ever equal to the expectations of Canadian consumers. 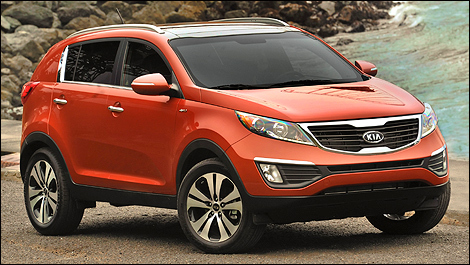 And when we talk about successful products, we can’t help but mention the Kia Sportage. The diminutive SUV, the previous generations of which were more famous for their ad campaigns than their actual capabilities, has evolved so thoroughly that it’s now at the heart of Kia’s success story. I know, I know, virtually every article you read about Kia’s products mentions, in one way or another, Peter Schreyer. We are hard-pressed indeed not to emphasize the quality of the designer’s work. Schreyer has literally revolutionized the design language spoken by Kia. He started redefining Kia with the Soul, and continued his mission with another noteworthy success: the Sportage. Traditionally, all sport utility vehicles have a bit of a common, bland look to them from the outside. Not so for the Sportage, though. Schreyer has imbued its lines with vitality. In concrete terms, the Kia Sportage is like nothing else in its class (other than its close cousin, the Hyundai Tucson). The mix of curves and sharp crests create an assertive stance when stopped and an impression of speed every time it moves. The front and rear lights are also uniquely shaped and blend in beautifully with the body for a consistent, contemporary and refined look. In other words, this Sportage could easily pass for a small luxury SUV. The cabin obviously got the same meticulous treatment. The dials are at the heart of things, easy to see and read. 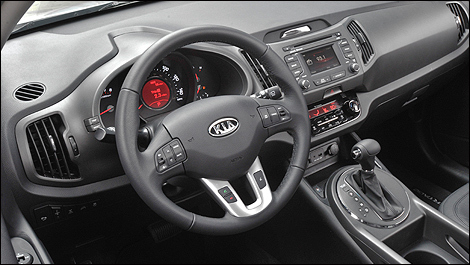 The controls on the centre console are ergonomic, and the whole package has a distinctly more contemporary feel to it. And it must be said, rejuvenating SUV dashboards is no small task.